I can recall when I was still in elementary school, being given by my grandfather a tackle box, a fishing rod, and an assortment of flies and lures. While I was quite fond of handling all these brightly-colored goo-gas, and imagining myself on the shore of a lake, luring in some cantankerous pike or walleye, the truth was that I was not even an aspiring angler. So the equipment lay unused in our garage. My grandfather and I, though blood relatives, were never close, and so the gift reflected his interests more than mine. As I have grown into my own interests, which I have seen flower into more focused and purposeful passions, I have cast about for the proper tools to bring them to fruition. Opening up Truby’s “practical poetics” for aspiring writers was like opening up that brand new tackle box with its sparkling trove of imitation minnows, but this time they were the rights tools-- or toys-- at the right time for the right person. For the past year and a half I have been tentatively and gracelessly trying to write, and I have searched for a set of rules to learn, the better to discover where they may break in a compelling fashion. 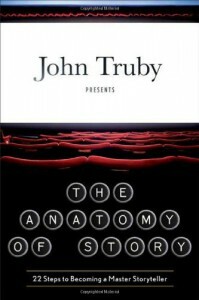 Truby’s strictures for good storytelling are specific enough and plentiful enough to provide a great deal of guidance, but not overbearing to a degree where they stifle one’s creativity. I feel as excited as a kid with his starter chemistry set or first set of wrenches. Not only do Truby’s ideas provide one with useful tools for bringing out the best in one’s own ideas, they also provide invaluable means with which to break down other stories into all their disparate working parts, the better to see what makes them work.